Quealth – Health Scoring App app: insight & download. Score your health with Quealth™ Score, track progress towards your health goals and be guided and supported to the healthiest you by Quealth Coach – your digital, personalised health coach. Quealth is all about understanding how healthy you really are. In other words, how living a healthy lifestyle reduces your chances of getting seriously ill in the future. Once you have answered any or all of our health checks, you get your Quealth Score – a health score between 1 and 100. The higher your score, the healthier you are and, most importantly, less at risk of developing any of these diseases. We’ll give you plenty of advice and information on where you might need to focus to improve your score – all for free. Quealth Coach – your personal, digital health coach – then helps you to follow a healthy lifestyle by guiding and advising you on how to make simple yet effective changes. You’ll get daily advice around how to become more active, eat more healthily, train for an event – whatever your personal health goals might be. 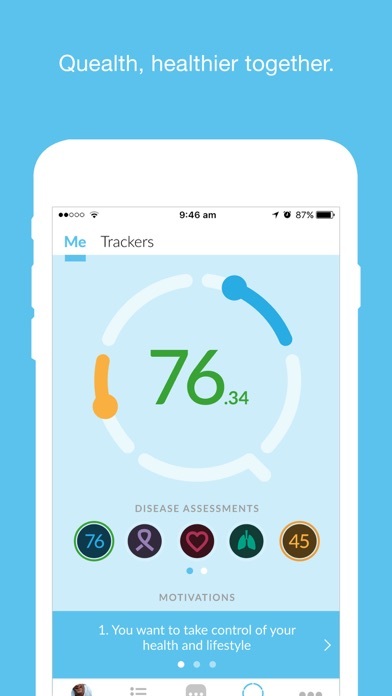 Our intuitive Trackers then help you to track your progress towards your goals; all to help improve your Quealth Score and become as healthy as you can be. Our most advanced in-depth and interactive Quealth Coach programmes: Move, Lean and Breathe covering physical activity, weight-loss and stopping smoking. These 12-week, daily conversations allow you to benefit from simple yet effective lifestyle changes that really make a difference, helping you to live a longer, healthier life. And we’re not just another health app – Quealth is based on clinically-validated health algorithms and evidence-based coaching and content. It has been developed – and continues to be optimised – in association with some of the world’s leading academic institutions to make sure it is as accurate and effective as possible. 17 September 2018 : Free! 21 July 2015 : Free!